Those are the words of Jens Jensen, the great landscape designer who celebrated the native and the natural and often included circular council rings in his garden plans. 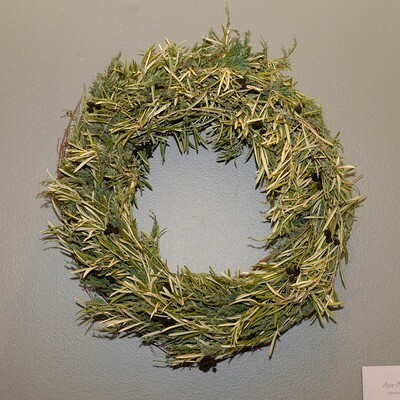 Ring in the new year with our staff’s creative interpretations of the circle, the ring, the wreath. This is a BIG wreath—great for an outdoor wall. Flint. Dent. Sweet. Flour. Pod. Pop. Regenstein Fruit & Vegetable Garden horticulturist Lisa Hilgenberg celebrates these six major types of corn—and beautiful heirloom varieties with names like ‘Blue Jade’, ‘Glass Gem’, and ‘Golden Bantam’—in a seasonless sunburst. 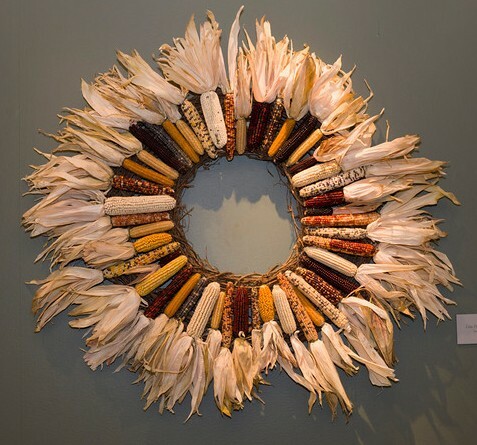 Children’s educator Kathy Johnson used just one ingredient for her made-by-hand wreath: natural raffia. 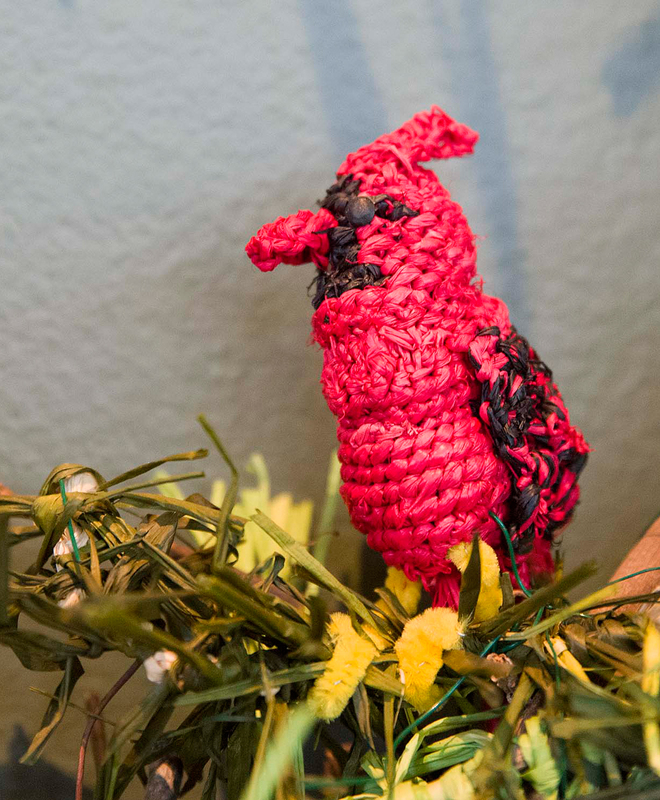 It’s hand-knotted into evergreen sprays and red berries, and crocheted into a life-like cardinal couple, nesting at the bottom. Even the branches of this wreath are made of raffia. A nursery grower in our production greenhouse by day, Lorin Fox is an artist and woodcarver off-hours. 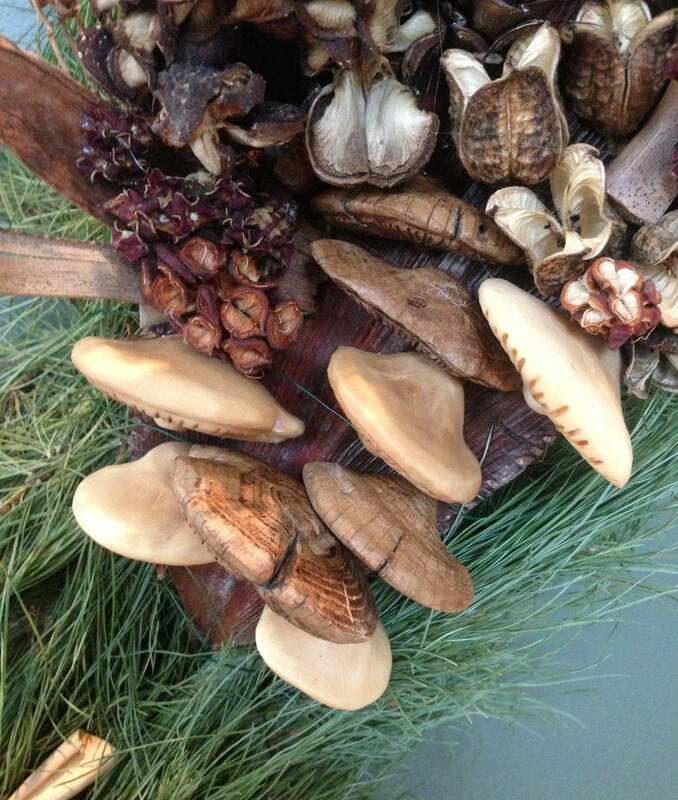 A close look at his wreath reveals the mushrooms he hand-carved from tagua nuts and cedar. Everlasting mushrooms were hand-carved from wood and nuts. The supersized fruit of ‘Ralph Shay’ crabapple dot the centers of milkweed pod “flowers” on this dramatic, dried Baptisia wreath by ecologist Dave Sollenberger. He foraged all of the materials from gardens here and at home. 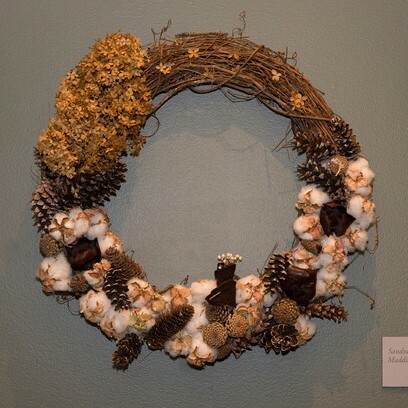 Cotton turned up as a natural and everlasting element in several wreaths. Wonderland Express = teamwork. So thoughtfully did the team from the Development Department (spearheaded by Lisa Bakker) brainstorm, gather, and plan for their wreath that it took them just two lunch breaks to assemble and decorate it. All summer long, assistant horticulturist Leah Pilon kept a sharp eye out for materials that dried well: the Carex seed pods, okra, millet, dried flowerheads (Green Ball dianthus), and Engelmann creeper vine (for the bow) were all collected in the Fruit & Vegetable Garden. Even okra works on this wreath made from materials in the Fruit & Vegetable Garden. Real olive leaves, with faux olive fruit (they’re alder cones, painted black). Christmas, New Year’s, Valentine’s Day, birthdays, showers, weddings: proof that one wreath can do it all. In simplicity is elegance. 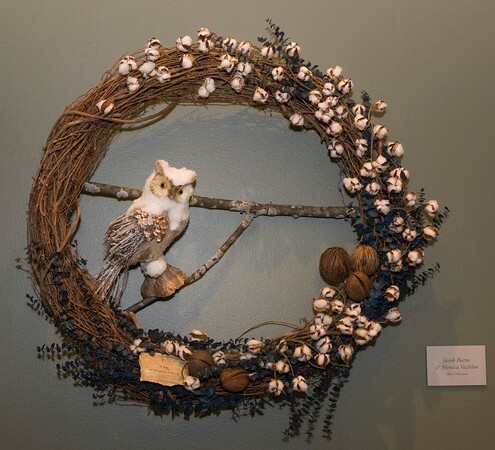 Made from grapevines growing in McDonald Woods, this heartfelt wreath by senior horticulturist Heather Sherwood can hang indoors or out. Leave it up straight through February 14. While the construction crew and the railroad guys were busy laying out the trains and buildings in Wonderland Express, 28 horticulturists and other staff members were busy building their own creations—making the wreaths that now line the Greenhouse gallery walls. The big “wow” story is that behind each wreath are the hands and hearts of our horticulturists, our maintenance staff, our plant healthcare guys, our security personnel, our managers, etc. Although each person started with the same thing—a wreath form and the beauty of the Garden—we are rocked by the imagination, talent, and joy that they brought to the project. It took Cindy Nykiel (tram driver) and daughter Stacey (security) 46½ hours to engineer a wreath loaded with fun details: birch bark train cars with pistachio shell trim, black bean “coal,” and tiny battery-operated lights twinkling within the ginkgo leaf/catalpa pod bow. A highly-decorated wreath by a mother/daughter team. The twisted palm frond rosettes are genius. A close-up of the palm frond rosettes. Bamboo sticks duct taped together for a frame. Red tube lights zip-tied to the bamboo. Red twig dogwood, raffia-tied over it all. Red tube lights work straight through Valentine’s Day. Nuts for the holidays? Plant Information Service Manager Kathie Hayden pairs nuts (oak, buckeye), beans (coffee tree), and pods (honey locust, sweetgum) with an appropriately amusing mascot. All but the walnuts (store bought) were collected from Garden grounds. A wreath with a sense of humor. Custodian Carlos García’s exuberant design is rooted in a vivid memory of a wreath he made in his fifth grade class in Ciudad Hidalgo, Michoacan, Mexico. The construction was a family affair: his kids helped with the cheery and heartfelt decorations. A great solution for a plain front door. Horticulturist Lisa Hilgenberg has a passion for seeds. Her stunning 11-bean-and-legume snowflake wreath celebrates the great variety found in just one species and hints at the fun we’ll be having at our second annual seed swap on February 24, 2013. By the horticulturist in our Fruit & Vegetable Garden. After cutting the birch trunks to size for Wonderland’s entrance hall, Exhibitions Manager Dawn Bennett took the leftover trimmings over to the carpenter shop…got out the chop saw…and turned waste into wonderful. A wreath made from slices of birch. 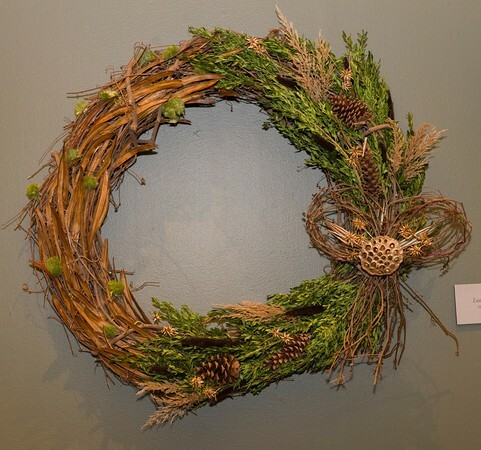 *Priced at $150 each, wreaths are available for pickup after January 6. 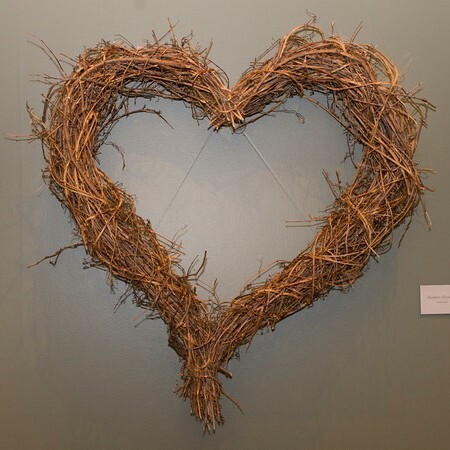 Many were made with dried materials gathered at the Garden, which may last for many months indoors.